"Ask and you shall receive! 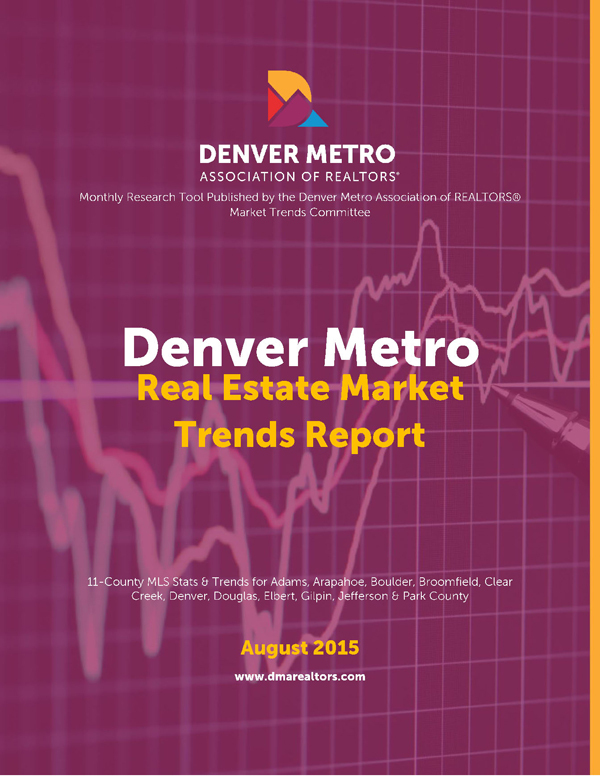 Denver REALTORS® have been begging for an increase in inventory for the past 12-months and July was just what the doctor ordered. New listings surged 5% over the previous month and 13% year-over-year which naturally helped ease the average and median prices. And just when you thought our days on market (DOM) couldn't get any lower…boom! The DOM for Detached Single Family Homes dropped an additional 15.5% from the previous month to 22. On the Condo side (aka Attached Single Family), the DOM inched down to 17 – one day less than the previous month. Digging into the sizzling hot July stats. As our market replenished itself with 7,494 new listings, 5,484 homes were placed under contract and 5,484 homes Sold and Closed. We closed out the month with 7,470 Active Listings – representing a 21% increase over the previous month, but that was still 10% less than what we had available in July 2014. As we look at the month-over-month Detached Single Family Home market, we saw a modest 6% increase in New Listings while the Average and Median Sold Prices decreased ever-so-slightly by 1.38% to $412,996 and 2.78% to $350,000 respectively. 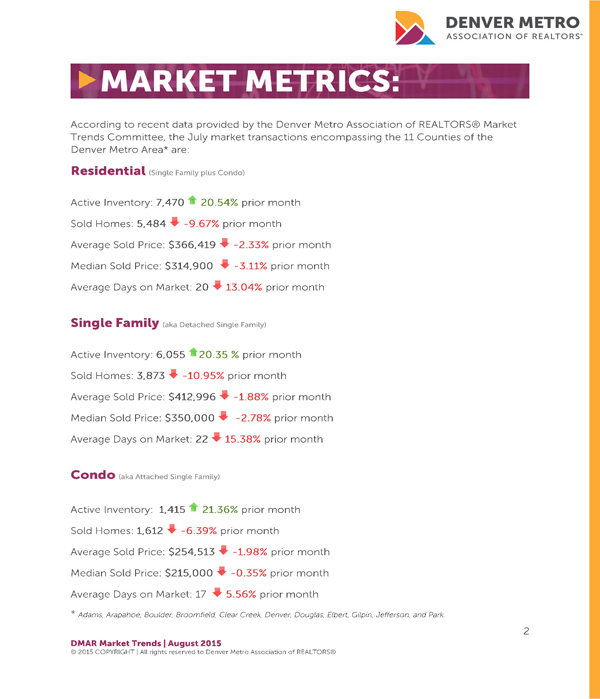 The Condo market (aka Attached Single Family) showed the supply of New Listings increase 2.48% over the previous month while the Average Sold Price dipped 1.98% to $254,513 and the Median Price remained relatively unchanged at $215,000. For the entire residential market, which includes Attached and Detached properties, Under Contracts decreased by 5.82%; Sold Listings decreased 9.67% and total Sales Volume dropped to $2 billion from the previous month. Finally, a quick summary of the year-to-date Residential market stats show new listings at 42,555; DOM at 30; Average Price at $363,016 and a record-smashing $11.45 billion in Sales Volume. 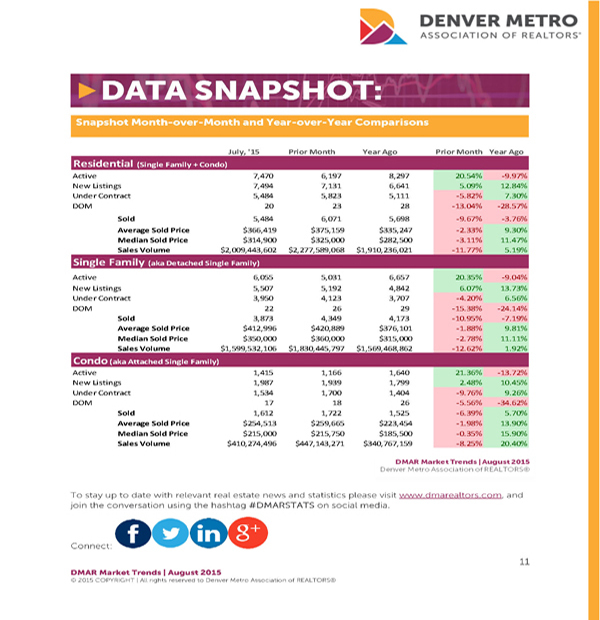 As I mentioned in last month's DMAR Market Trends Report, the Denver-area's overall real estate market was showing signs of "easing up" or "cooling off" as we entered the prime home buying season and some sellers were beginning to sense a slight shift in the market. 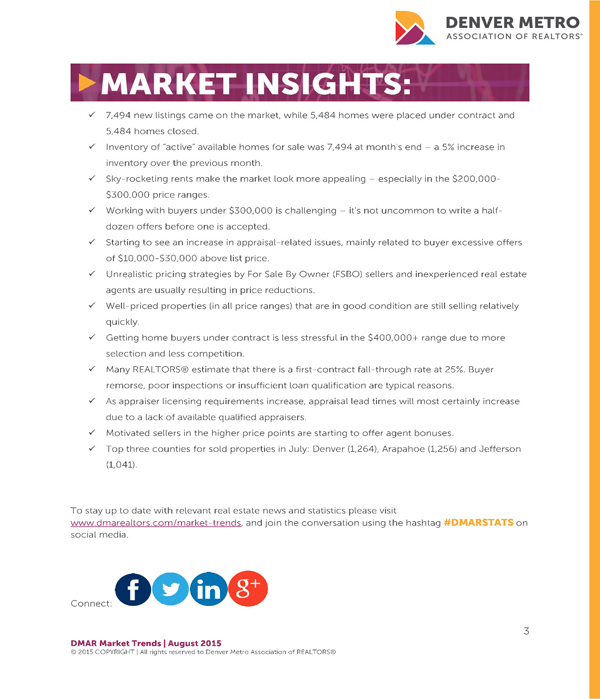 DMAR's July statistics appear to support that sentiment as a 20% rise in Active Inventory at month's end will most certainly increase buyer's chances of finding the home of their dreams, particularly as mortgage interest rates continue at historic lows and prices begin to ease. This is all welcome news for home buyers who have survived the recent months of our market frenzy. Even with the most recent decline in average and median sales prices, sellers have done remarkably well by realizing double-digit price appreciation in our year-over-year analysis." Denver Post - "Metro Denver home market cools down in July"
Denver Real Estate Watch - John Rebchook - "DMAR: New listings surge in July"
Denver Business Journal - "Colorado's home-price pressure eases with influx of new listings"
Kiplinger's Personal Finance - "Money-Smart Tactics to Prosper in This Hot Housing Market"